Totton & Eling Cricket Club, is the perfect wedding venue, situated in a peaceful setting, conveniently located within a few miles of both Southampton and the New Forest. 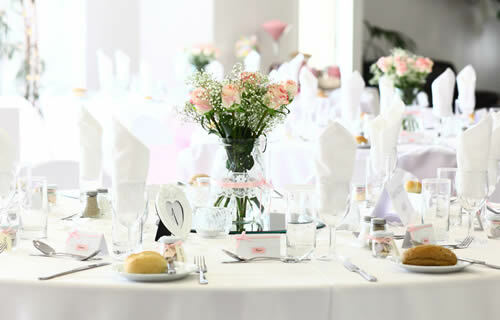 Our modern clubhouse, patio and terrace offer charming panoramic views over our cricket grounds, creating the perfect backdrop for your Reception. Depending on the time of year you & your guests could be treated a live cricket match in play. Whether you require a small private wedding breakfast catering for 10 guests, or a larger celebration for up to 200 guests, you can be assured of a quality, personal service and a warm welcome from a team of staff passionate about making your day special. Our dedicated Wedding Co-ordinator will be on hand from your initial enquiry right through to your big day, to ensure it is an event for you and your guests to remember and treasure. No matter what time of year your wedding is planned, we can provide a beautiful setting at an affordable price, tailor made to suit your requirements and budget. You can view a selection of images from our recent weddings by clicking on the Instagram link at the bottom of our homepage. Designed to take some of the stress away from planning your special day we offer a complete Wedding Reception Package. Our superb Wedding Package is based on catering for 50 day guests & 100 evening guests and includes everything you need to make your day a fantastic one! We pride ourselves on our honesty and service so you will find no hidden costs. 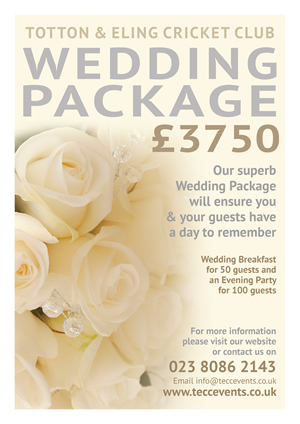 The Wedding Package can be upgraded to suit your individual requirements. For more information of what is included in our Wedding Package please click on the link to the right of this page. Are you getting married abroad? Would like a Wedding Celebration Party to share with your Family & Friends? We offer a superb Party Package catering for 80 guests. For more information please go to Function Hire and click on Parties. If you would like to make an appointment to view the Function Room or check availability please contact us on 02380 862143.